Hi, everyone – just some minor updates. First, Vanguard goes live on 01/02/2016. Feel free to pre-order it from Amazon now (links and free sample HERE). Second, paperback copies of Hard Lessons, The Black Sheep and Storm Front are now available from CreateSpace. Signed copies will be available from me personally, soon. Third, an audio version of Never Surrender is up for pre-order now. Audio versions of A Learning Experience and Schooled In Magic books are on the way. Fourth, as I keep being asked this question, the current schedule is Sons of Liberty (underway), They Shall Not Pass (TEC 12), Infinite Regress (SIM 9), Chosen of the Valkyries (Twilight 2) and [classified] (SIM 10). Fifth, I’m currently sketching out notes for a couple of new stand-alone books; more on those later. And finally, check out my Facebook fan page for a great free offer! If there is nothing else that can be said about Vox Day – and a great deal of nonsense has been written about him – it is that his mere existence is a testament to the damage done to free speech and common sense by the politically-correct. To try to avoid giving unnecessary offense is a laudable goal, but to declare whole fields of study verboten because of the potential for offense is just plain stupid. Worse, perhaps, when the difference between words and reality becomes impossible to avoid, it undermines faith, the faith we need to keep our society running. Reality does not change on command. After the runaway bestseller SJWs Always Lie (reviewed here), Vox Day tackles two subjects that don’t, on first glance, seem to go together. On one hand, there is the tidal wave of immigration pouring into America (and Europe) and, on the other hand, there is the supine surrender of American Conservatives to liberal thoughts and ideals that have very little relationship to reality. These people have become known as ‘Cuckservatives’ – a combination of ‘cuckoo’ and ‘conservative’ and the fact that the word itself has been declared offensive tells you a great deal about its power. A cuckold is a man who, unknowingly, raises the child of another man as his own. (The word itself comes from the cuckoo’s habit of laying its eggs in another bird’s nest, then relying on the mama bird to raise the baby cuckoos (at the expense of its own) until the babies are large enough to flee the nest.) A Cuckservative, not to put too fine a point on it, is a Liberal pretending to be a Conservative, a person who may stand for election (in America) as a Republican, but upon being elected acts as a Democrat. These people are also known as RINOs; Republicans In Name Only. The charge is that Cuckservatives not only betray the people who elected them, but the country itself. This is most prominent when it comes to immigration. Vast numbers of Americans (and Europeans) want the doors slammed shut, while their elites want the doors left open. It doesn’t seem to occur to the elites that allowing vast numbers of people from a different cultural background into America (or Europe) does not automatically make them good citizens. Vox is at pains to deconstruct both the ‘magic dirt’ and ‘blank slate’ theories, although neither theory stands up to even the slightest hint of examination. The American ‘melting pot’ worked, at least in part, because immigrants were not only separated from their homelands by vast oceans (no longer a problem, thanks to air travel) but forced to blend in to get along. Even then, there were problems, most notably when the immigrants couldn’t hope to pass for locals. As has been noted elsewhere, Vox illustrates how the charge of ‘racist’ has been used to silence opposition to everything from immigration to multiculturalism. By declaring whole fields of study off-limits (as I noted in the first part of this review) the elites only created a vast mass of seething citizens who were unable to articulate their concerns – or were attacked savagely, when they dared. The logic of this is not only hazy, but non-existent. One simply does not have a country if one cannot control who enters, let alone enforce the laws in large swathes of the land. The idea that denying immigration rights is somehow racist is thoroughly absurd. This largely accounts for the rise of Donald Trump, whose defiance of the elites has turned him into a (somewhat unexpected) champion of people who feel themselves downtrodden and ignored by the elites. Frustration with the elites and fear of the enemy within have pushed Trump up to the point where he is a serious contender for President, even though he might well make a poor President. At base, the interests of the elites and the people they represent have shifted. The elites get to feel good about themselves (as well as getting cheap labour) while the people they represent get shafted. Quite apart from the social problems, an influx of cheap labour makes it harder for uneducated natives to get work, turning them against the immigrants. The conviction that immigrants get everything on a silver spoon, while hard-working natives get nothing, is lethal, even if it isn’t true. It is worth noting that Vox overlooks two separate aspects of the ‘Cuckservative.’ The first is the nature of American politics, which has been a two-party system for centuries. A ‘Republican’ or a ‘Democrat’ may be very different from his fellows, but still under the same tent, thus we have Jeb Bush and Donald Trump, or Hilary Clinton or Bernie Sanders. The various politics thus blur together as the party prepares for the next election. The second, perhaps more corrosive, is that elites generally meet other elites. Jeb Bush has far more in common with Hilary Clinton than he has with Joe Average. There is an understandable inclination to please those who are closest to them, particularly when they are living away from their states. This would be bad enough, but it also works on an international scale. Their perception of foreigners may be driven by people who were educated in America (majored in Western Hypocrisy?) and know how to present themselves to Westerners. Thus Hilary Clinton can meet with a diplomat from a country where women are chattel and genuinely get along with him, even though he is not representative of his country. Coping with this problem requires constant refreshing of the tree of politics, by refusing to re-elect politicians for more than two terms in office. But I rather doubt that any politician will genuinely propose term limits for anyone. 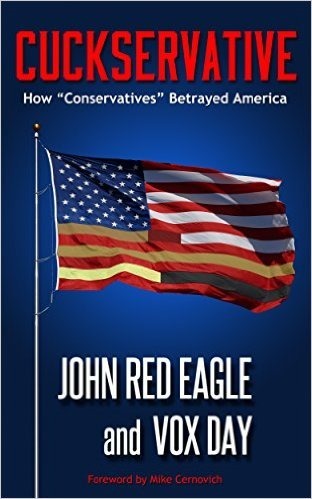 Overall, like its predecessor, Cuckservative is a must-read. You may not agree with Vox Day (the person or the straw demon portrayed by his detractors), but you should consider his arguments before choosing to dismiss them. At least you’ll know what you chose to dismiss. I had a discussion with someone about publishing, promotion and suchlike that led to this article <grin>. A year or so ago, there was a brief buzz about an article that insisted that JK Rowling should stop producing books because other writers needed a shot at the golden ring. The article attracted a great deal of scorn, understandably. Why should JK Rowling stop writing when she has literally millions of fans? The odd thing about it, at least when it comes to traditional publishing, is that the author had a point. Baen Books, the smallest of the big publishers, puts out around six books a month. They also have a handful of writers – David Weber, John Ringo, Eric Flint – who are heads and shoulders above the rest, in terms of books sold. If Baen had a choice between a new Weber book and a book by an unknown author, which one do you think they’d choose to publish? Baen is pretty much the best major publisher at finding and putting out new authors, but I’d be surprised if they chose to skip a Weber book for an unknown. Tor, too, would be foolish to put an unknown in front of George RR Martin or Brandon Sanderson. They need to make a profit. This happens, at least in part, because publishing a book can be expensive. Traditional publishers pay for everything, from heavy-duty editing to producing paperback books and paying the author a small advance. Even the biggest publishing firms cannot publish too many books in one month for fear of over-extending themselves. Therefore, in traditional publishing, there is a case to be made that established authors freeze newcomers out of the field. But this simply isn’t true of indie publishing. People read faster than authors can produce novels. That is a simple fact. No author, not even JK Rowling, has fans who are devoted to her and her alone. I don’t believe there were many Harry Potter fans who read nothing else between the publication of Half-Blood Prince and Deathly Hallows, or gave up reading when the series finally came to an end. No, they went out and looked for other books to read. JK Rowling kick-started hundreds of thousands of kids into reading books, but she didn’t keep them all to herself. No author could hope to produce enough books to do that. Even if they did, I doubt many traditional publishers could handle it. Traditional publishing does produce winners and losers. A famous author will get far more promotion than a newcomer. And yes, some of those authors will be unjustly treated because they have the misfortune to be competing with someone who started out by selling better before they ever got into the field. Traditional publishing is a zero sum game. The books have to be balanced. This is not true of indie publishing. Indie publishing has two great advantages over traditional publishing. First, anyone can publish a book (this is, of course a great downside too) at minimal cost. Second, the field is so large that one writer doesn’t dominate the field simply by existing. Not to put too fine a point on it, I am not in cutthroat competition with Chris Kennedy, James Young or any other indie author you care to mention. My success doesn’t overshadow them; their success doesn’t overshadow me. None of us really benefits from engaging in genteel backstabbing as there is nothing to be gained by it. We are not in direct competition over a scarce handful of publishing slots or promotional efforts. The field of customers is immensely vast and, more importantly, it is not exclusive. I can’t hog all my readers to myself even if I wanted to. A handful of newcomers to the field don’t seem to grasp that, I will admit. There is no shortage of stories about ‘kindle authors behaving badly.’ Getting published traditionally tends to give newcomers a maturity that many kindle authors lack. But I think that most kindle authors recognise that they are not playing in a zero-sum game. There is room enough for everyone. There are other advantages, of course. There are no gatekeepers. In traditional publishing, books can be rejected because the editor was having a bad day or the writer’s politics clashed strongly with the editor’s. Though indie publishing, the author can appeal directly to potential fans and build a reputation that isn’t dependent on any publisher. But, most of all, there is room enough for everyone. Success – or failure – no longer rides on a publisher. The civilised parts of Earth (North America, Western Europe, Russia, China, Japan, Australia, Israel, Brazil) are united in the Federation, a marriage of convenience. All member states are fascist to some degree; on one hand, there’s a great deal of personal freedom (the war on drugs is long in the past), but political freedom is almost non-existent. The war against terrorists has gone on so long that a surveillance state seems normal. Government is pretty much a mixture of democracy, corporate fascism and outright dictatorship. Basic foodstuffs and entertainment is free. Life is pretty good in the Federation as long as you don’t rock the boat. Outside the Federation, there is chaos. Governments rise and fall, often within days. The Federation watches from high overhead and drops KEWs whenever a steady government seems to be forming, or there is a realistic chance of a terrorist group or rogue state building nukes, biological weapons or long-range missiles. Living standards have been slipping for decades, not helped by mass expulsions of undesirables from Federation territory. Average life expectancy is forty years. Governments started a serious move into space long before the Federation came into existence (2060). Terrorist and cybernetic attacks made it an urgent priority. The development of fusion power, running on HE3, pushed various governments into establishing mining colonies on the moon, then cloudscoops orbiting Saturn. (Jupiter is considered too dangerous to use as a fuel source.) Solar power satellites provide additional power for the Federation; asteroid mining cuts off all dependence on materials produced outside the Federation. The moon was settled in 2040. Despite a brief rebellion in 2050 (workers rebelled against appallingly bad working conditions) the lunar population continued to grow, particularly after the addition of gene treatments preventing Lunar Rot (muscle decay). Luna is now a patchwork of colonies, some operated by the Federation and others owned by corporations or individuals. Humans first set foot on Mars in 2044, then started a major terraforming and colonising project in 2050. (There were protests against wrecking the native environment, but the protesters were rapidly rounded up and sent to work camps.) Massive colony ships arrived over the following 50 years, bringing hundreds of thousands of colonists to Mars. As of 2100, Mars has a very thin – but breathable – atmosphere and a growing population. Asteroid settlement started in 2039, starting with small mining ‘towns’ that rapidly grew into populous settlements. Governments saw the asteroids as a place to put groups that were both awkward and potentially useful. A number of small corporations established research bases in the asteroids, which often spawned independent colonies that hid from government authority. As relatively little tech is needed to support an asteroid settlement, no one is entirely sure just how many settlements there are. A number of independent asteroids have small industrial complexes, where spacecraft and spare parts are produced. Others attempt to raise foodstuffs, although Earth is still the main source of fresh (and very expensive) food. The Federation controls a small fleet of interplanetary cruisers and troop transports (the former have more in common with modern-day submarines than surface ships) which are intended to patrol the spaceways. These forces are intended primarily to deal with rebellions on Luna and Mars (the Federation had to improvise to crush the first rebellion on Luna and hasn’t forgotten the experience), although they have been deployed to support corporate factions when their workers proved rebellious. In recent years, the Federation has been building more warships, despite the lack of any credible threat in space. The Belt Association suspects that the Federation intends to crush it when the time is right. In addition, the Federation deploys 10’000 Space Marines; men and women trained for deployments in space and non-terrestrial worlds. The Federation makes no attempt to dictate the internal policy of its member states. Overall matters are decided by secret negotiation between the members and presented to their respective populations as done deals. On Earth, it’s still possible to pretend – and believe – that there are multiple independent nations. In space, the Federation is far more powerful. It claims jurisdiction over the entire solar system, appointing everything from judges to colony governors (a point that is increasingly resented on Mars, Luna and the Belt.) Balked at any chance at power on Earth, the Federation has grown increasingly oppressive to the colonies. The Federation’s government is … complicated. Governments have a major say, but so do corporations. (One can argue that the whole system operates like the Republic of Gondar; the more one invests, the more say one has.) Corporations have practically unlimited control over ‘company towns’ (corporate asteroid settlements), while there are a handful of settlements that are effectively independent. Some company towns are run with a very loose hand, other towns are run so badly that minor rebellions and sabotage are a constant problem. The Belt Association is the closest thing to a non-Federation political entity outside Earth itself. However, it is not – by any earthly standards – a reasonable government. It is, at best, a tissue of agreements signed by various Belters, which are enforced by social pressure and a handful of law enforcement officers (Belt Marshals). Generally speaking, the Belt has two principles; one may do as one wishes, provided that non-consenting people are not involved, and honour contracts. Paying what one owes is practically the founding principle of the Belters – a Belter who does not honour his word, for whatever reason, will rapidly be denied everything from docking to fresh oxygen. Belters are not ruthless, but they can be strikingly pragmatic. They rarely give second chances. The bigger asteroid settlements are democracies, mainly run through electronic networks (allowing every adult a vote.) Others have more restrictive franchises. The Kingdom of Pallas, for example, is solely governed by the King and his family. Unlike Earth, the Belter Internet is largely free of any form of censorship, but suffers badly from time-lag caused by being spread out over light-hours. Many Belters while away the long hours in transit writing posts to internet newsgroups or downloading the latest stories, videos and VR packages from the net. The Belt, unlike Earth, has no laws against bodily modification. There are some Belters (Spacers) who have been heavily augmented, to the point where they can survive in space without protective suits. Others have been genetically engineered, both to prevent Lunar Rot and extend their life spans. -An author on Luna published an EBook entitled ‘Musings On The Belt,’ which concluded that the governments on Earth were already so dependent on the Belt that the Belters could not only claim their independence, but bring Earth to heel. He was arrested before he could flee Armstrong City, shipped back to Earth and disappeared. All copies of his book vanished from Earth’s internet, but other copies made their way to the Belt where they were keenly studied. -A large-scale uprising on Mars (after it was announced that a further hundred thousand settlers would be deposited on the planet) successfully took and held territory for two and a half months before reinforcements were rushed to the planet. The Federation, evidently concerned by both by the uprising’s success and the simple lack of warning any of its intelligence operatives supplied, crushed the uprising with more brutality than usual. It was not, however, able to keep word from spreading through the rest of the system. -The Federation’s decision to organise a ‘Belt Court’ to handle legal matters concerning the Belt, specifically issues surrounding the claiming of asteroids. Previous Belt formalities weren’t just ignored, they were brushed aside. Combined with a handful of demands for extradition of former corporate serfs who vanished into the darkness – a demand the Belt could not have met, even if it had wanted to – it sent a strong signal that the Belt’s days of semi-independence might be coming to an end. UP NOW–Falcone Strike (Angel In The Whirlwind II)! Download a FREE SAMPLE, then purchase (ebook, paperback, audio) from Amazon: US/UK/CAN/AUST! Written for publication in The Times, London, 1831. Article suppressed at the request of His Majesty’s Government. It has just been reported that the French, having somehow escaped our doughty sailors in the Grand Fleet, have landed a major army on the shores of our beloved country! French soldiers have been reported at Dover, Hastings, Eastbourne and Brighton! French ships have been reported ravaging the south coast and trading fire with the batteries defending Southampton and Portsmouth! French airships have reportedly attacked defensive positions in Tunbridge Wells! The treachery of the French Tyrant-King in launching such an invasion will not go unpunished! Addressing the Members of Parliament in joint session, LORD LIVERPOOL, HIS MAJESTY’S PRIME MINISTER, informed them that British troops are already being dispatched to Surrey, where they will push the dastardly French back into the sea! The DUKE OF INDIA has resigned his former post and taken command of the army! Our sailors are already moving the Channel Fleet to block all lines of retreat, despite shifty and cowardly attacks mounted by French submarines! And the Royal Sorcerers Corps, Britain’s great strength, is moving to support the counter-attack, led by the formidable LADY GWENDOLYN CRICHTON! His Majesty asks that every true Englishman do his duty to keep the French from crushing our troops, invading our cities and ravishing our women! The Lord Mayor and Governor-General of London has issued a proclamation to the citizens of his city. Martial Law is now in effect! All members of the regulars, the militias and the trained bands are to report for duty immediately, where they will be issued with weapons. All able-bodied men who are not already serving or in vital positions are to make themselves known to the Area Wardens, who will assign them to positions building up the defences. All women and children are to remain in their homes, unless ordered to do otherwise by the Area Wardens. Anyone found on the streets without permission risks arrest and possible detention. Martial Law is now in effect! Do not share rumours, lies or other stories that might cause panic and upset. Do not discuss your work, or your husband’s work, with anyone. The person you talk to might be a French spy! Something you consider to be harmless might be very dangerous indeed, if told to the wrong person. All citizens are warned to keep their eyes open for signs of French spies or sympathisers! Call the Area Warden AT ONCE if you suspect someone is aiding the French! Martial Law is now in effect! All members of the London Police Force have been armed and ordered to enforce the curfew. Members of the lower classes are warned that anyone caught looting, rioting or otherwise taking advantage of the invasion will be shot on the spot. Do not panic! Do not despair! Do not listen to false rumourmongers! The French will be repelled from our walls and shoved back into the waters, where they will drown! Gwen gave him a sharp look. Shaw had been assigned to her – and Merlin, the sorcerous combat team – at very short notice, too short notice. He was handsome enough, she supposed, but his bombastic attitude made her suspect that he’d bought his commission, rather than earning it through talent. And the looks he gave her, from time to time, suggested that he was one of the men who thought women shouldn’t be anywhere near battlefields, no matter how much magic they had. She felt sweat running down her back as the sound of distant gunfire grew louder. The French had successfully occupied a line running from Dover to Brighton, she’d been told as the Royal Sorcerers Corps hurried to join the defence line, but they wouldn’t stay there for long. Landing on British soil, after decoying the Channel Fleet out of position, had been a daring stroke, yet the Royal Navy was already moving to block both their reinforcements and their line of retreat. The French had no choice, but to advance on London as quickly as they could, living off the land. And good luck with that, she thought nastily. The government had worked hard to move as much as it could out of the threatened area, although countless small farmers had refused to uproot themselves to an uncertain fate. There isn’t enough fodder between here and London to keep even a small army going for more than a few days. Gwen felt another flicker of irritation, which she swiftly suppressed. If Major Shaw had been in combat before, she would have eaten her hat. There were no shortage of officers with experience in India, Africa and North America, but they were needed elsewhere. Shaw might have been assigned to her because the Duke of India, an experienced military man, thought it would keep him out of the way. There was no room for an inexperienced officer when Britain herself was at stake. She smiled at his astonished look – she might as well have been speaking French – and turned back to watch for advancing enemies, feeling his eyes boring into her back. Major Shaw wouldn’t expect a woman to understand the basics of logistics, let alone military operations … but Gwen had been studying them ever since Master Thomas had died, leaving her the Royal Sorceress. She’d always feared this moment would come, the day she had to lead the Royal Sorcerers Corps into battle. And the hell of it was that no one would blame her – publically – if she backed off and allowed Sir James Braddock to take command. But they’d whisper about it privately, she reminded herself, firmly. A man who turned his back on the enemy would be called a coward, loudly and clearly, but women weren’t expected to be brave. There were no women in the red-coated infantry readying their defensive positions, no female sailors manning the decks as the Royal Navy advanced into the channel … just her, the lone sorceress on the battlefield. No one would ever take me seriously again. She ran her hand through her sweaty blonde hair, silently grateful she’d cut it so short. Long hair might be a mark of distinction among the quality – she knew girls who had hair so long it dragged on the floor – but it would have gotten in her way, if she’d had to fight. The outfit she’d inherited from Master Thomas was hot and stuffy, yet she knew she couldn’t change it for anything, not now. At least she wasn’t trying to fight in a dress. She had a sudden mental image of herself crouching in the woods, wearing a long green dress, and snickered at the thought. She’d look thoroughly absurd. He cantered away, just as the French magicians came into view. Four men, flying through the skies like birds. No, not quite; two of them were Movers, providing the motive power, while the other two were Blazers, watching for targets on the ground. One of them sent a pulse of magic crackling downwards as she watched, although she was unsure what he’d seen as there was no one further southeast than her force. Maybe he’d just spotted a rabbit and blasted the poor animal, just to be on the safe side. Or to add to their rations. Gwen was sure the French magicians ate well – they needed to be well-fed to use their magic – but even they had to be feeling the pinch. The French Navy couldn’t hope to keep them supplied. He pulled the trigger. The gun barked. It was a good shot, part of Gwen’s mind noted; he would have hit his target if the enemy magician hadn’t been protected. But all it had done was reveal their position to the enemy. Gwen swore, using words she’d picked up from some of the soldiers, and launched herself into the air. The French Blazers targeted her, streams of magic crackling over her shields; she smiled, then reached out with her own magic, yanking the Blazer away from his comrade. He plummeted towards the ground, screaming in terror. The Mover hurled himself forward, his magic grappling with Gwen’s and trying to crush her in her own shields. He was powerful, she noted, as she hit the ground and bounced; certainly more powerful with his single talent than she was with her multiple talents. But he wasn’t prepared for her. She used her own magic to create a blinding flash of light, disorientating him long enough for her to charge the ground below him with magic. Seconds later, it exploded inside his protective shields. They snapped out of existence, allowing him to burn his head to ash. There was no point in taking chances with a magician. Strong man, she thought. She wasn’t sure she could have held her shields in place, if she’d been blinded. The shock alone would have weakened her. A shame he was on the wrong side. She glanced up as she felt another spike of magic, then slammed her shields into place as a pair of French Movers charged her, their magic picking up trees, rocks and soil, hurling them towards her. The instinctive response was to hurl herself upwards, out of the way, but she knew that would be a mistake. One Mover would be enough to pull her out of the sky; two would be enough to rip her apart, if they caught her between them. Gritting her teeth, she summoned a wave of fire and threw it back at them, trusting in her power to shield herself from their makeshift weapons. Her head began to ache as … things … pounded into her shields, but she held firm. The torrent of projectiles disintegrated into dust, then came to a halt. One of the Frenchmen was starting to choke. Idiot, she thought, coldly. Breathing smoke isn’t wise. … And was sent careening into the air as Sir James slammed into him, his magic smashing right into the Frenchman’s protections. He caught himself and hung in midair, glaring down at his new foe. Gwen forced herself to summon another spark of magic, then nodded to Sir James. The Mover yanked on the Frenchman’s shields, pulling them open long enough for Gwen to hit the Frenchman with a pulse of magic. His body and power disintegrated in the same instant, leaving pieces of blood and gore to fall over the battlefield. Gwen stumbled to her knees almost as soon as the enemy died. Darkness flickered at the corner of her eyes, threatening to pull her down. She hadn’t pushed herself so hard since the Swing. Where I nearly died, she reminded herself, as she heard the sound of running footsteps. And I would have died, if Jack hadn’t saved me from Master Thomas. Gwen scowled at him. Sir James didn’t have to worry about being thought a weak and feeble woman, even if she did have the heart and stomach of a man. She couldn’t leave, not without undermining her position so badly she knew she’d never recover. Besides, if the French took London, she’d be doomed anyway. They’d hardly take the risk of letting her live. Indeed, given what she’d heard from Jack and the treacherous Sir Charles Bellingham, she was privately resolved to kill herself rather than allow the French to take her prisoner. She had a very good idea what they’d do to her. Gwen felt her cheeks heat. Merlin was a team, but she wasn’t part of it. Sir James took magicians with different talents and worked them into a whole, she had all the talents, yet preferred to work on her own. But she couldn’t afford to work on her own in wartime. She needed to learn to fit into a team. She broke off as she felt another spike of magic. A trio of Frenchmen were running towards them, surrounded by hideous monsters. Gwen had to admire their skill, but not their common sense. The illusions were striking, too striking, to be real. It would have been more effective, she noted as Sir James wrapped them both in a protective shield, if they’d created a vision of French soldiers charging their position. A soldier on the battlefield might well have thought that illusion was reality. Gwen nodded, then reached out with her magic and caught hold of all three Frenchmen, hurling them up and into the air. Unlike the Movers, Blazers couldn’t fly under their own power. They’d fall to the ground and die, when gravity reasserted itself. She let go of them, wondering absently just where they’d land. Maybe they’d come down right on top of the Frenchman in command. She half-expected Sir James to insist she came with him, but he said nothing and merely strolled off to the southeast. Gwen felt an odd stab of envy, then reached for her magic and tested it, gingerly. She still had enough to be dangerous, she reassured herself, if she needed to fight. Bracing herself, she pulled her magic around her and rose off the ground and into the air. Her ears were still muffled – she made a mental note to check with a Healer, after the fighting was done – but she could hear the sound of artillery fire. It was hard to be sure, but it seemed to be growing closer. And the hussars were mounting a charge against the French lines. She felt her heart drop into her boots as the charge picked up speed. The French were battered, yes, but they weren’t broken. As she watched, they formed a square and greeted the hussars with canisters of grapeshot. Gwen tried to think of something – anything – she could do, but there was nothing. The hussars were brave men. They didn’t break, they didn’t run, but it hardly mattered. The last of them fell from his horse and died well before reaching the French lines. I gave them no orders, Gwen thought, as she dropped down towards her command tent. Who sent them out to die? Gwen felt her temper snap. The hussars had been thrown into battle and slaughtered, for nothing. There was nothing wrong with taking decisive action, but the moment had been wrong. And he had felt he could disobey her because she was a woman …? Instead, she turned her back and walked back to the war. Sorcerer To The Crown is a difficult book to review. In all honestly, I was first alerted to its existence by a couple of mentions by various left-leaning bloggers who praised the book for its grasp of social justice and the nuances of race and racism. I was not impressed by the idea and put all thought of the book aside until I saw a copy in the library and noted that Sorcerer To The Crown had also been compared to Jonathon Strange and Mr. Norrell, one of the most impressive fantasy works of the last decade. That was enough to convince me to take the book home and read it. The book does have its moments, but it also has a number of problems. Zacharias is a likable character – I like him – yet he doesn’t have the presence necessary to lead the Royal Society. He is ineffectual; not because of his race, I hasten to add, but because of his lack of presence. I can see several reasons for his enemies to want to remove him that have nothing to do with his colour – they need Nick Fury, when what they have is a decent man out of his depth. Zacharias himself notes, furthermore, that some people have good reason to distrust him – no one apart from him knows what really happened when the last Sorcerer Royal died. They ask if he murdered his foster-father (he didn’t). Prunella, by contrast, is a far less likable character. She’s prideful, arrogant, reckless and headstrong, a dangerous combination. She doesn’t read out as a character who is perched permanently on the edge; indeed, she seems to act as though she belongs even though she should be aware that she doesn’t. (She is aware, at times, but her general attitude suggests otherwise.) This wouldn’t have been too bad, but she keeps saving the day despite her lack of knowledge and a striking ruthlessness (and a willingness to commit an act that shocks everyone.) She is, in short, a deeply flawed heroine and the text doesn’t seem aware of it. The enemies are also a very odd bag. There are some hints of competence at first – an assassination attempt on Zacharias nearly succeeded; it would have, if Prunella hadn’t been there – but they rapidly decline in competence. Zacharias’s enemies turn out to be humdrum opportunists, while the enemies of Britain herself work by appealing to outside help, rather than fighting the evil British Imperialists themselves. Truthfully, this book misses a few points about both racism and power struggles in the Regency Era, both more nuanced than the author suggests. Race relations in the British Empire were often complex; it was far from uncommon for Indians and even Africans to win respect from the British, particularly the races that fought effective campaigns against Britain. (It was Africa’s bad luck that many Africans were happy to sell their enemies into slavery, both to Westerners and Arabs.) Yes, skin colour would have told against both Zacharias and Prunella, but perhaps not as badly as the author supposed. (Particularly as Prunella’s ‘coming out’ seems to work fairly well, despite her tinted skin.) The world the author creates, furthermore, has magic in hands that are clearly non-western (the Chinese magician, in particular.) This would have had a major effect on race relations. A second point is that power struggles within the elite (which includes Zacharias) were often genteel exercises in backstabbing. There might well be a great deal of respect between politicians who were on opposite sides, but that didn’t stop the different sides from struggling for supremacy. Given Zacharias’s weaknesses as Sorcerer Royal, discussed above, the colour of his skin may not have played a particularly large role in his unpopularity. Rather like President Obama, there are plenty of good reasons to feel he’s the wrong man for the job that have nothing to do with racism. Overall, the book has many interesting moments. But in trying too hard to make points about racism, sexism and suchlike – and resting too much on a deeply unlikable character – it undermines the story itself.